Free download Super Motocross Africa game for PC. It is Motor Bike racing game developed by MyPlayCity. Super Motocross Africa is very amazing game with light weight and good graphics. 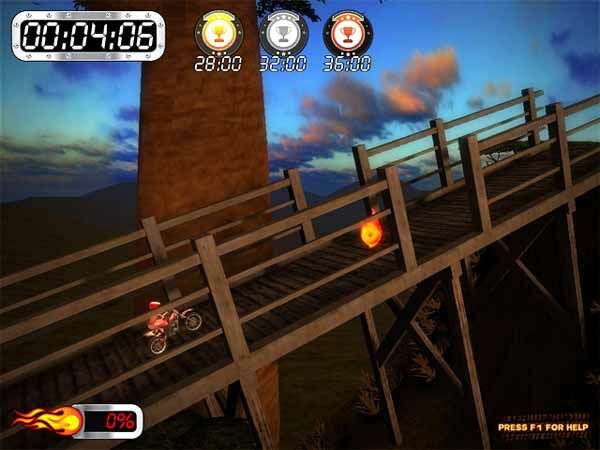 Super Motocross Africa is 2D game and you have to cross different rounds in this motor bike game. Installation of Super Motocross Africa game is very easy. Just download the setup that is not more than 3 MB. After downloading the setup, run it. The game will be start to download through MyPlayCity downloader. The game real size is about 87 MB. It will take some time. During the installation, you can select custom installation and uncheck the promotional software. After installation, the game will be started. From the main menu, you can start new game, continue your saved games, and change sound and music volume from Options and exit the game. When you start new game, you are asked to enter your name. After that, you have to select the game mode. There are two modes in Super Motocross Africa game; Time Trial and Star Collector. In Time Trial, you have to complete the round within the given time. There is a specific time to win Bronze, Silver and Gold Trophy. When you select any game mode, then you have to select the level of the game. Only the first level Flyover is unlock at the start of the game. The next level will be unlocked when you achieved the Bronze Trophy in previous level. There are 6 levels in this game. After selecting the level, you have to select bike. Here is also the bike Grinder KRZ is unlocked. All other bikes are locked. There are four bikes and to unlock each bike you have to win silver trophies in various numbers. For example, you can unlock the bike Masterbike 3000 after achieving 2 silver trophies.